Rarely do we look upon a landscape that is truly arresting. Through-hikers may trek miles into the wilderness in search of little more than this feeling, a particular sense of place that pulls us from our everyday experience and thrusts us forth into awe. And while these sublime moments often require some searching, in Yosemite they greet us around every corner. With nearly a dozen 1000 foot waterfalls framing its rim, set beside impossibly sheer granite walls, falling into an abundantly lush valley floor, it's no wonder many refer to the Yosemite Valley as a natural cathedral. The Valley is unmatched in its grandeur and subtlety, so if nature is your religion, this church is for you. Get baptized in the waters of the Merced, reach samadhi atop Half Dome, and bliss-out in the pure stateliness of the Sierras, but before you go, be sure to check out this helpful visitor's guide. We've included information on attractions, camping, the seasons, packing, permits, and more to make sure your trip to Yosemite is truly divine. Spanning over 760,000 acres, with over 5 million annual visitors, the majority visiting only the Yosemite Valley's tiny footprint of 6 square miles, there is plenty of Yosemite to discover beyond the crowds. And while the Valley's top attractions can be seen on the loop through its bottom, we recommend spending plenty of time outside of the car, as the best parts of the park are to be experienced on foot. Go for the views. The most iconic of which are Glacier Point and Tunnel View. Both easily accessible from the car, Tunnel View offers a near unbeatable vantage down the valley towards Half Dome in the far distance. From what is undoubtedly the nicest parking lot in North America, Tunnel View looks out upon the entire Yosemite Valley with views of El Capitan, Half Dome, Sentinel Rock, Cathedral Rocks, and Bridalveil Falls. It's easy to spend an hour here simply looking upon the park, but we recommend getting here early in the morning so that you can avoid the crowds, or better yet, during a passing storm or on a full moon. From Glacier Point you can take in the whole of the valley as well, but from above. About a 45 minute drive from Tunnel View, this vista looks directly upon Half Dome and the many waterfalls spilling into the basin below. From this bird's-eye perspective of the park, it's easy to imagine the giant glaciers that must have run through the valley some 20,000 years ago, creating what is today a geological masterpiece. Second perhaps only to Tunnel View, Yosemite Falls is one of the most recognizable features of the park. This is for good reason, as it is not only visually striking but happens to be the highest waterfall in North America at 2,425 feet tall. The best way to take in the view of the falls is to do a short walk along Lower Yosemite Falls Trail, an easy 1.1 mile loop and only 1/4 mile to a great vista. For an even better view of the falls consider walking one more mile up the Upper Falls Trail to get a great view of both the upper and lower falls. For those looking to get a more intimate, albeit demanding, impression of the falls, consider hiking the 7.2 mile round-trip hike to the fall's crest, a climb of nearly 3000 feet. If you're looking for a couple other quick hikes that are not too strenuous then consider trekking to Vernal Falls (2.4 miles round trip) and Mirror Lake (5 miles round trip). While Yosemite Falls is spectacular, it is only a seasonal waterfall, as it relies on snowmelt for its stream. So for those waterfall lovers visiting in the Summer months, consider checking out Bridalveil, Vernal, and Nevada Falls, as they tend to flow year-round. Stand beside the largest trees on the planet. How big you might ask? Well at 96 feet in circumference the "Grizzly Giant" is certainly a huge tree. The Giant Sequoias are an evergreen conifer and close relative of the Coastal Redwood, putting them in a rare class of megaflora. Some of these trees have been growing in the tempestuous Sierras for over 3000 years, reaching heights well above 200 feet. There's no better way to get a sense of their size than to stand at the base of one, so make plans to visit either the Merced, Tuolumne, or Mariposa groves of Giant Sequoias and get ready for a sore neck. If the really old is more impressive to you then the really big, consider visiting the oldest trees on the planet as well. The Bristlecone Pine has been growing in the Eastern Sierra for as long as 4800 years, and seeing as they are only a few hours drive east of the valley in the White Mountains, it is definitely worth considering a visit if you're planning to continue down Highway 120 and 395. Just as an Ansel Adam photograph of the valley is no more striking taken in winter or summer, so to is the park a place to be enjoyed in all seasons. Sitting at 4000 feet, Yosemite does experience a dramatic change of seasons, but for those willing to brave the elements great moments of solitude await. Peak season tends to be from the last Monday in May to the first Monday in September, Memorial Day to Labor day, so make sure to plan accordingly. Summer brings warm dry weather to the Sierras, with only 5% of the annual precipitation falling in summer. What rain does reach the mountains, it comes as quickly forming thunderstorms, something to be wary of if planning to summit during these months, as they can rapidly develop and bring intense downpours, gusting winds, hail, and lightning. Despite these occasional storms, the days can climb to 100°F (38°C), and nights often offer a cooling respite with beautifully clear views of the heavens. The highcountry of Tuolumne Meadows, which sits at 8,600 feet above sea level is usually much more temperate, hovering between the 70s and 30s even in mid-summer, so make sure to bring clothing for all four seasons regardless of the month. Fall weather ushers in a some of the nicest weather of the year, as bright blue days and calm clear conditions persist between the passing storms which announce the arrival of winter. The Valley can appear more dry during this time then even the summer months, as many of the rivers, streams, and waterfalls are fed by the snowmelt from higher elevations. As September passed on into October freezing temperatures return to the higher elevations and fill the nighttime air. By the middle of October the Valley's deciduous trees begin to show rich Fall hues of gold, russet, and umber making for one of nature's most striking displays. By late October and November the Sierras are usually just one storm away from being thrust into Winter, bringing a calm to the park not seen for months. Winter sees the first real accumulation of snow in the Sierras, as cold and wet weather begins to set in. Over two-thirds of the year's precipitation will fall between the months of November and March, much of this is snow. By mid-November temperatures allow for the snow to build into a seasonal snowpack, particularly above the valley's rim (4,000 feet). Over 6000 feet snow coverage is often consistent and at times can reach well over 20 feet deep, closing all mountain passes. Capturing countless gallons of water above, these massive snows are what drive the waterfalls of the Valley. The event of the season is undoubtedly the "Firefall" at Horsetail Falls, where the sunset's last rays seem to ignite the fall's cascade into a glowing display (February 12th-28th). The snowy tread reaches its peak in mid-March and then subsides as the Sierras again begin to warm. Spring turns open meadows into blooming wildflower gardens and the rivers and waterfalls of the Valley into dramatic torrents, as the winter snowpack begins to melt away. While higher elevations often remain inaccessible, under many feet of snow, the days grow warmer, though still mild, reaching into the 70s, and the nights stay crisp, at times freezing. It is not uncommon for Tioga Pass and the high country of Tuolumne Meadows (above 8,000 feet) to be impassible this time of year. And some years, access won't open to these areas until well into June and July. Nevertheless, Spring offers an ideal time to visit the valley before the summer crowds arrive in mass. Packing for a trip in the Sierras should always consider the seasonality of the region. With temperatures varying dramatically within the course of the day and with the elevation changing by thousands of feet within less than a mile, it is essential to pack layered clothing that can be taken on and off as needed. A good waterproof outer shell, heavy weight insulation, and wool or capilene base layers are important components of a well layered kit. Just as the elevation may call for warm clothing, the same can be said for your bedding, so we recommend bringing along a down or synthetic sleeping bag with a rating of 15° F (-9° C) or better. Aside from making sure you stay warm and dry, you'll want to be prepared for the Sierra's notoriously intense sun and even more intense mosquitos. We recommend packing a zinc based sun-block and a DEET bug spray. While somewhat controversial, DEET is extremely effective and has proven to be non-toxic to humans and the environment when used as indicated. As there are few alternatives that offer DEETs level of deterrence, you'll thank us later for mentioning this as our preference. Half Dome is one of the few day hikes that requires a permit to access. If you're visiting between the end of May and the beginning of October, you may want to consider taking on this truly adventurous trek. Using the assistance of steel cables and foot holds, the trail up the sloped face of Half Dome is as close to rock climbing as you'll come on a day hike. If you are at all afraid of heights or are just looking for a relaxing outing in the park, then this should not be your first choice of venue. Allowing a maximum of 300 hikers a day, the Half Dome Trail opens its preseason lottery from March 1st through March 31st, with daily, two day in advance lotteries held towards the end of May thereafter. Make sure to visit the park's lottery system to reserve ahead of time. Wilderness Permits are also required for anyone looking to overnight on the many trails throughout the park. Available by lottery up to 24 weeks prior to your departure date, these permits are best reserved well in advance, as not only do the popular routes get booked-up quickly, they are also not able to reserved for same-day trips. Make sure to pick up a fire permit. These are essential if you plan on having an open flame in the backcountry and required even if you only plan on using a gas stove to cook on. Stop by a ranger station or get one online. They're free and can save a forest from being lost to future generations of visitors. Quick note here, over 80% of "wild" fires are caused by humans, so take this very seriously. Any discussion of Yosemite is woefully incomplete without mention of John Muir. Now an often quoted Scottish-American naturalist, Muir was a clarion voice behind the American shift towards conservation and the designation of the Yosemite Valley as a National Park. Travel around California and his legacy will be seen indelibly etched upon the land in the many public parks that now bear his name. Of all the wild spaces that Muir travelled through in his wanderings, which were wide, once traversing a thousand miles across the country on foot, it is Yosemite that arguably had the greatest impact on him and which today reiterates the ineffable value these natural places provide us. Muir was a prolific writer and his book, The Yosemite, gives a rare view into a man in love with the land. If you're looking to channel your inner Muir and see the park through the lens of his endless wonder and adoration, then this is a must read on your visit. What Muir captured in prose Ansel Adams immortalized in image. Adams is know for his classic black and white photographers of the American West and most notably of Yosemite. It can be hard to look at the valley and its monuments without seeing his images imposed on the land, think "Monolith" and Half Dome. His images are from a time when the National Parks were largely devoid of visitors and there is little argument that his work propelled the Park System into wide recognition and enabled their protection more broadly. Today, both Adams and Muir's commitment to preservation lives on not only through their works but through the efforts of the Sierra Club, which they were instrumental in forming. Visit the Yosemite Conservation Heritage Center when in the valley to learn more about the organization and its heritage. Open from 10 a.m. to 4 p.m. from May through September, the center offers special events in the evening on Friday and Saturday nights (tickets available at 7:15 pm, doors at 7:45 pm). Before it was Yosemite it was Ahwahnee, and the people who called it home were known as the Ahwahnechee or 'Yosemite Vally People.' With evidence pointing to their continuous habitation of the valley from as early as 3000 years ago, the Ahwahnechee's historic use of the land can still be observed today, if only in artifact. Despite their absence today, signs of their lives in the valley still remain. Come across an open meadow scattered with oak trees, and you may feel that you have arrived in a natural paradise. The landscape may even appear to be manicured. This is no misperception. Relying upon the oak to sustain them, the Ahwahnechee used controlled burns to shape the valley to better suit their needs. The burns crafted a landscape ideal for harvesting the oak's acorns and accessing other natural resources which is today visible. Look to the riverine granite and you may come across a rock slabs that was at one time used to process acorns into flour. A staple in the diet of the valley's early inhabitants, acorns required laborious processing to make edible. Large mortars were carved into the rocks over generations by hand-driven pestles. Today this is one of the clearest signs of their presence in the valley. Tragically, the destruction of the Californian native population and Native America in general, can not be understated. It is a great stain on American history. The Ahwahnechee are now an officially extinct group, and while this designation is contested by local indigenous leaders, visiting the park today is in many ways devoid of the culture that once called it home. For valuable insights into the history of Native America, we recommend the book Bury My Heart at Wounded Knee and visiting the Indian Village of Ahwahnee, located behind the Yosemite Museum. With names like Royal Robbins, Yvonne Choundard, and Lynn Hill, and more recently Tommy Caldwell and Alex Harronld populating its rich history, Yosemite has been the center-piece of the climbing world, and in many ways of outdoor culture, since the early 1960s. Royal pioneered free-climbing in a time when the massive granite faces of the Valley, El Capitan and Half Dome, required bolts and pitons to complete, so ushering in the current modern age of sport climbing. Choundard, a contemporary of Royal's, is known now as the founder of the major American clothing brand Patagonia, but back in the day he was leading an affectionately termed "dirt-bag" existence in Camp 4, living only to climb, fish, and play in the Valley's outdoor playground. And inspiring a generation of climbers of all genders, Lynn Hill was the first person, man or women, to not only free-climb the Nose of 'El Cap' but subsequently complete the route in under 24 hours. Perviously it had taken four to six days to complete and is still considered one of the most challenging lines up the face. And now, where free-climbing had allowed for teams of two to move up a face quickly, without drilling and placing iron spikes into the wall, free-soloing has emerged, loudly declaring that climbs over a 1000 feet could be achieved without any rope at all. While Hill undoubtedly assisted in this progression, it is names like Tommy Caldwell and Alex Honnold that dominate any discussion of the Yosemite climbing scene. Alex made international news with the first rope-free ascent of El Cap and the team has now recently completed the Nose in under two hours. For perspective, get a view of El Capitan from Tunnel View, its the insanely large hunk of granite on the Northern or leftmost side of the valley. Make sure to stop by Camp 4 on your loop around the valley to see climbers prepping their gear for multi-pitch or multi-day outings, and try to spot them along the various cracks of El Cap when you pass by. Roughing it has its merits, but sometimes we all just want to treat ourselves. If you're looking for fine-dining in an atmosphere reflecting the history of the valley, and perhaps even its grandeur, then the Majestic Yosemite Dining Room at the old 'Ahwahnee Hotel' is first on your list. The hotel itself is a National Historic Landmark, built in a style known as National Park Service Rustic or "parkitecture," so if you are looking to check NPS heritage dining rooms off your list this place is a must. The Ahwahnee is considered the crown jewel of these works, which are also typified by Zion Lodge, Bryce Canyon Lodge, and Grand Canyon North Rim Lodge. The Dining Room provides a fine-dining menu and requires appropriate attire, so expect to pay to experience the Majestic's history, quality, and ambiance. Let's face it, most valley visitors are drawn by its stunning surroundings and not by its culinary flare. If you're hungry and looking for something to meet everyone's needs then Degnan's is for you. Most dining options within the park are mediocre at best, especially if you've had a couple days in San Francisco prior to your trip (definitely ask us for dining recommendations in SF, as its a 'foodies' paradise), but if you've hiked Upper Yosemite Falls or any number of the valley-to-rim trails you'll be ready to eat just about anything, and they've certainly got that. With the closet alternatives being between 30-60 minutes away, the Tuolumne Meadows Store is a welcome oasis in the these wild parts. This is the central hub for climbers, fly fisherman, and backpackers as they fill up their coolers and packs between outdoor exploits. It's also the only place in this part of the park you'll be able to order prepared food, grab a cup of coffee, or find that missing toiletry item you forgot to pack. The grocery selection is surprisingly well stocked for this market's size and location, so if you're looking for a quick bite or that missing condiment this is your stop. If you've never had a "Monorito" you are missing out! At the end of the 120 lies the town of Lee Vining and one of the finest supermarket burritos we've ever tasted. These warm, wrapped wonders buck the trend of most quick-stop, pre-made meals, as they are delicious, come with vegetarian options, and are a great grab-and-go for trips down the 395 in search of secret hot springs or back into the high country in search of more adventure. Mono Market also has a full grocery, so it's a great stop to restock your pantry. When it comes to camping in and around the Yosemite Valley you have a few different options: reserve ahead, try and grab a first-come first-served site, or rely on dispersed camping outside of the park. For those wanting to spend multiple days in the valley or planning to set off on an early morning hike up Half Dome, we recommend booking a campsite close to whatever trailhead you plan to set out on. And for those who just want to see the sights and then get out into the backcountry, there's no better way to enjoy the area than camping within the nearby National Forests. All reservations must be placed online through the recreation.gov website or upon arrival, which is never a sure-thing. Get close to all the action with a spot on the valley floor. These sites are walking distance from the major trails, valley shuttles, and restaurants. Reserve ahead for peace of mind if you know exactly when you want to visit. If you miss the tight booking window (5-months to the minute ahead of your stay), consider reserving midweek and checking availability for single night stays, as opposed to longer blocks. During the winter months only three of the above mentioned campgrounds stay open: Upper Pines, Hogdon Meadow, and Wawona. All others are operated seasonally, so referencing historical opening dates is very helpful when planning a visit. If you're stressed out by the prospect of reserving a site within Yosemite, then rest assured, as there are a far too many campgrounds nearby for us to even begin to discuss here. Make sure to check out the various options in Stanisluas, Sierra, Inyo National Forests for a great selection of nearby alternatives. If reservations fail you and all the campsites are full, as can often be the case, don't stress: the best know-secret to exploring the National Parks is their neighboring National Forests. With miles of scenic backroads, these infrequently visited tracks are not to be missed if you are prepared for some off-the-grid camping. Just like many of the West's national parks, Yosemite is surrounded on all sides by public lands. Offering a mix of wilderness and vehicle access areas, the forest systems around the park provide visitors the opportunity to camp without reservations. Referred to as "dispersed camping," the National Forests and BLM lands provide public access to many free camping sites. Although these spots might be short on facilities, they more than deliver with their beauty, tranquility, and sense of connection to the natural environment. You'll need four-wheel drive and plenty of provisions when setting out to camp so plan accordingly. Dispersed camping is what our vehicles do best, so definitely ask us for a curated map when you rent from us, as this will be a great way to get a sense of the area and its camping options. If you're curious to learn more about dispersed camping, make sure to read our article on it to learn more. Finally, even though we offer a turn-key car camping solution, we still believe that one of the best ways to experience the backcountry is on foot. For this reason we also recommend planning an overnight somewhere only your boots will take you. Get a permit and hit the trail! Campfires cause wildfires. In fact, the very term "wildfire" is somewhat of a misnomer, as humans are the cause over 80% of these fires. This does not have to be the case. Before having an open fire outdoors or even using the dual-burner stove we provide you, it is imperative that you receive a campfire permit and obey all guidelines when camping/cooking. Know and comply with all current fire restrictions for the area where you plan to use a campfire. Clear all flammable material from the ground in 5 feet in all directions from the edge of the fire. Keep a shovel and water nearby. Keep the fire small - within 2 cubic feet. Always keep a watchful eye on the fire until it is fully extinguished. Always make sure your fire is completely dead before leaving it unattended. Use the "drown, stir, and feel" method to assure it is completely out and cold to the touch. Bears are keen opportunists who can and will take advantage of any available resource. The best way to keep a bear and yourself safe is to take proper care to store your food and clean your camp. When in the Yosemite Valley you may store food inside your car, so long as it is out of sight, with windows completely closed, and during daylight hours. After dark you are required to use a food locker to store your food. Even canned food and drinks as well as spent wrappers can attract a bear to a vehicle. Food lockers are available throughout the park near parking lots, at campsites, and major trailheads as well as throughout the backcountry. When traveling in the backcountry and within the National Forests and relying upon dispersed camping, food lockers may not be readily available. Although we have found that bears are often habituated to specific campsites, favoring popular locations where food is frequently available, so not often encountered in the backcountry, we still recommend storing your food in closed containers, out of sight, and away from the reach of bears. When nature calls, be ready to answer. Carry enough personal hygiene products to manage your bodily needs in the bush and be prepared to 'pack it out' if required. That's right, not every location allows you to dig a cat-hole, so make sure to carry the appropriate waste management items. Cleanwaste toilet kits are a great option here, but when it comes time to dig make sure to minimize the chance of water pollution, the spread of disease, and the aesthetic impact, while maximizing the decomposition rate. No one wants to see toilet paper hanging from the bushes, and animals can and will search it out, so dig at least 6-8 inches down and at least 200 feet from camp spots and water sources. No matter where you're coming from, if you're entering the park by car you're bound to use one of the three major highways, be it the 120, 140, or 41. Each has its own appeal as well as some seasonal considerations, so make sure to check current road conditions and pick a path that best suits your itinerary. One of the most crucial things to note about the highways through the park is that they are not always open to through traffic. Most notably here is highway 120's Tioga Pass, which is closed during the winter months, usually between November and May. Even if you are planning a trip in late October or early June, you may find the pass to be closed, as its opening is entirely dependent on the winter snow pack. The same is true for road to Glacier Point, as this is also a high-elevation drive. Plan ahead and check the latest information on the pass before departing. Additionally, Yosemite is one of the only places that during the winter months will require not only four-wheel drive but snow chains as well. Though this shouldn't concern you much, as we will supply you with both, make sure to go prepared. As far as which highway to select when traveling from San Francisco most will choose to take the 120, which offers a dramatic descent into the valley along Big Oak Flat Road. If you continue East on the 120 you will head into the high country and Tuolumne Meadows before cresting Tioga Pass and dropping down into the Mono Lake Basin. We recommend taking this through route in the Summer and Fall months (May - October), especially if you are hoping to visit the Eastern Sierra, and certainly if you are hoping to enter the park from the east (from our Las Vegas location). As an alternative to the 120, Highway 140 follows the snaking path of the Merced River along El Portal. Due to its proximity to the river it enters the park at a lower elevation than the 120 to the north, so if the weather is rough and wintery conditions prevail the 140 may be a preferable. It will generally have less snow and does not involve the steep drop into the park that gives the 120 its appeal in better weather, so consider this route as a back-up. The 41, or Wawona Road, enters the park from the south after traveling through Sierra National Forest. We love this route either for approaching or exiting the valley because we find Sierra NF to be an incredibly beautiful stretch of backcountry. Sneak in a hike to some of the regions lesser-known sequoia groves or stay the night in a dispersed site before entering the park. Even if you skip Sierra, the riverside camping at Wawona Campground is some of our favorite in the park. Regardless of the road you choose into the valley, make sure to bring a set of snow chains and a four-wheel drive in winter, as well as a healthy dose of patience in summer, for all may be required. While most roads in the park are sealed and designed to accommodate the millions of annual visitors, just outside of the parks' boundaries there are miles of empty dirt roads to explore. One of our favorite ways to experience the Sierras around the Yosemite is to get out of the park and onto the dirt. Whether on foot or in your vehicle, this is certainly the best way to escape the crowds and get into the wilds. Sierra and Stanislaus National Forests both offer world class backcountry roads, which are every bit as striking as the National Park. Although most visitors to the Valley will zip right past it, you can enter the Park traveling along the original stage road, which to this day remains unpaved. Old Coulterville Road, or Forest Route 1S12, travels from west to east towards the valley as it follows the path taken by some of the parks earliest visitors. And while this road offers a novel way to enter the park, our favorite tracks run through Sierra National Forest's expanse of high sierra backcountry just to the south. If empty alpine meadows, resplendent granite domes, remote lakes and waterfalls, and lesser-know, sequoia groves sound enticing, then Sierra may be your idea of paradise. After a day in the park, head an hour south to the towns of Fish Camp and Sugar Pine where forest service roads split away from the highway. 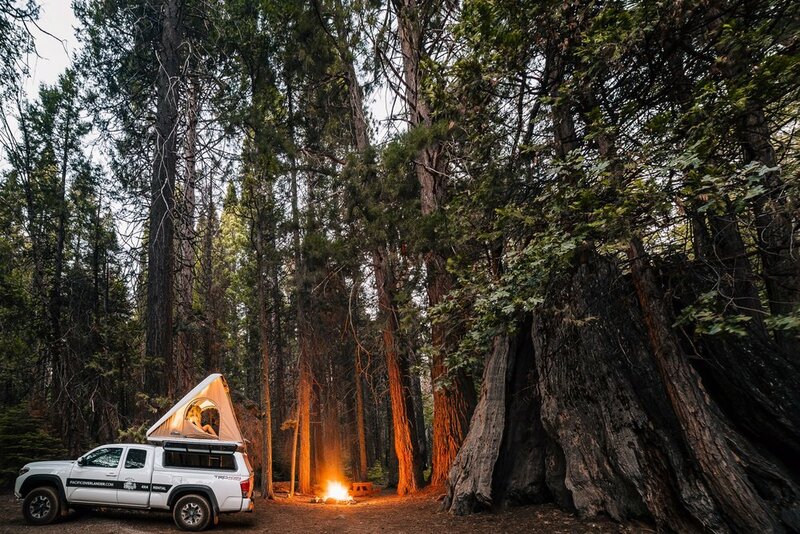 This area offers great reservable campsites and a number of dispersed camping options to explore, making it an excellent book-end to your Yosemite trip. If you're heading into the mountains to explore on the dirt, make sure to stop by the rangers station to grab a regional map and ask about seasonal closures. Keep in mind that snow and storms can make these roads not only challenging but dangerous, as fallen trees, mud slides, and high water levels can obstruct safe passage. When in doubt, wait it out. Yosemite National Park is without question one of America's great natural wonders. Worthy of every bit of the adoration it receives from those who have visited, it offers everyone access to experience the immense power of the wilds. We certainly need places like Yosemite, if for nothing else then to remind us that the hand of nature is in many ways mightier than that of man. Remaining a wild and untamable landscape, there is certainly plenty of wilderness to explore beyond the Valley, and countless dirt roads as well. We hope everyone gets to visit this embodiment of 'America's best idea,' Yosemite National Park.